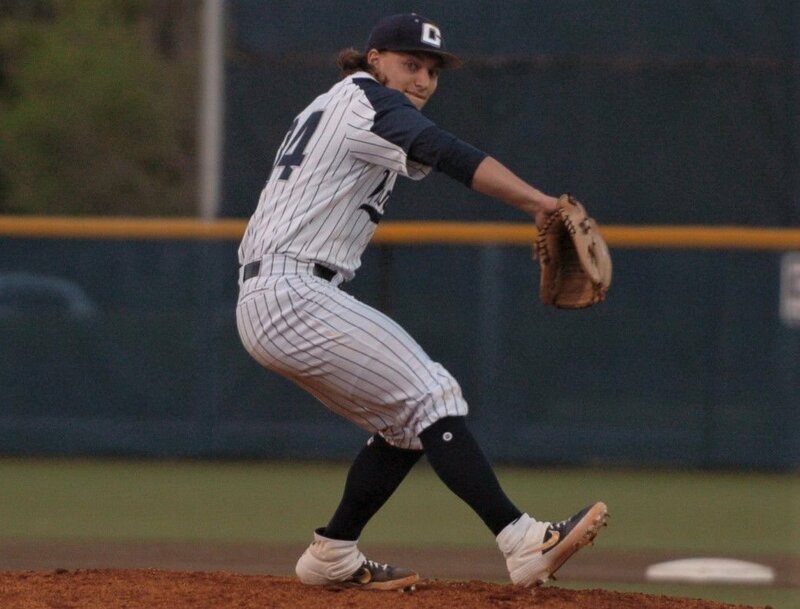 Calvary Christian senior Nolan Hudi has yet to surrender an earned run this season over 23 1/3 innings pitched. He fanned a career-high 13 batters in just five innings Friday against Clearwater Central Catholic. Calvary Christian junior Samuel Gordon comes home to score the game’s first run Friday during the Warriors’ 7-2 win over rival Clearwater Central Catholic. The center fielder entered this week batting .379. CLEARWATER – The epic 60-game winning streak is old news, as is the run of 55 straight victories in non-district-tournament regular season matchups. Calvary Christian entered this season without dropping a regular season contest since falling to Berkeley Prep on April 11, 2016. After jumping out to a 4-0 start to the 2019 campaign, the Warriors were tripped up at home March 12 during a 2-0 defeat against Class 4A District 4 foe Tampa Prep. What’s that mean as Calvary moves forward this season? Not much. Streaks are nice and victory is the goal each and every time cleats hit the turf, but this Warriors program is interested bigger, more illustrious accomplishments. Coach Greg Olsen has built Calvary Christian into a nationally acclaimed state power and that strives for nothing short of a Florida High School Athletic Association Class 4A championship. The Warriors accomplished that feat for the first time in school history in 2017 and nearly did it again in 2018 before losing 5-1 to Fort Lauderdale Calvary Christian Academy in the title game. Last month’s loss to Tampa Prep is a blip on the radar and the team’s bounced back to win five straight. Calvary entered this week 9-1 overall and atop the District 4A-4 standings at 4-1. The Warriors wrapped up last week with a commanding 7-2 win over rival Clearwater Central Catholic and star pitcher Nolan Hudi said the Tampa Prep letdown is being used as a positive for a team playing growing together with a few new pieces. Hudi’s been doing a great job showing the way as one of this year’s team leaders. He made six appearances in the team’s first 10 games, going 4-1 overall and has yet to yield an earned run. The Warriors’ pitching staff boasts a 1.40 ERA as fellow seniors Braden Halladay and Josh Emerson give Calvary once of the area’s most-formidable rotations. Limiting opponents to fewer than two runs a night takes plenty of pressure off a revamped lineup, yet the Calvary offense is keeping pace by posting more than seven runs per game. The Warriors have seven regulars batting .350 or better, led by sophomore third baseman Tommy White (.452, 13 RBI), senior shortstop Christian Cairo (.429, 14 runs) and Hudi (.450, five RBI). “It’s a little bit of a different team, different vibe, but same gritty, get-after-it, go-to-work team,” Hudi said. The Warriors lost Division I talents Matheu Nelson, Eric Kennedy and Justin Bench from last year’s roster but added a trio of junior transfers in second baseman Vince Smith, catcher Pierce Chambers and outfielder Jack Speights. Calvary came into this week with an opportunity to avenge the Tampa Prep loss, heading to Hillsborough County Tuesday night. The Warriors get another District 4A-4 test Thursday at Tampa Catholic and wrap the week up with a Saturday home date against Naples Barron Collier.